A Black 47 gig in the early days of the bar. Wow. I wish I had this 25 years ago, when I wasn’t quite legal and desperate to get inside the doors of the place! Security was tight, which added to the mystique -- the entertainment inside might have consisted of an old banjo player passing gas, but when you were stuck on the outside with a line full of people thirsty for a pint lining around the block, the mystique about what you were missing inside made it the hot spot of Manhattan. “It’s really the original Irish music bar out there and it still has a good name,” says publicist and Irish music promoter Anita Daly, head of Daly Communications, when asked to comment about Paddy Reilly’s and the music scene. “There are a lot of bands outside of New York who are anxious to play there because it means you’ve broken the Big Apple. I always try to work new musicians in there because the scene there is good and the craic is always great. 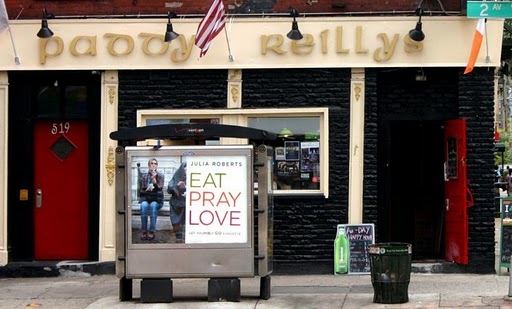 “People that go to Paddy Reilly’s really go there to listen to music; it’s not just people going to the bar to watch TV. It’s really all about the music and the performance there.” For Black 47‘s Larry Kirwan, there is a sense of coming home when he plays there. “We got a lot of resistance on our sound when we first started out but we got 40-50 fans amassed in each borough during those early days,” he recalls. The back of the card doubles as a coupon for a free drink ticket, which expires December 2012. The Cavan native’s card is laminated and has the words “special guest” emblazoned on the bottom, which makes it a VIP card. Flash this at the door and it tells everyone that you know the owner. The joke, the art of the deal, and the slick charm on the card is the true representation of the man. “He is very astute in that way and he is a very good promoter,” Kirwan says of Duggan. “He also booked us years ago. He was sending us to Irish festivals that were used to Paddy Reilly and the Wolfe Tones. It caused a huge stir at the time. “He saw the change coming in Irish rock. He would strong-arm us in the set --‘You want Paddy Reilly, you gotta book Black 47, too!’ You can’t beat a Cavan man for cutting a deal! “We generally play much larger venues – in New York City alone we’ve played Webster Hall, Lincoln Center and B.B. King’s, and we just headlined the House of Blues in Cleveland for Paddy’s Day, but no venue has been more important to the band in terms of growing, developing new material and just providing a warm home in a peripatetic existence,” reasons Greg Grene of the Prodigals. “We must be doing something right to be here 25 years,” asserts Duggan pragmatically. “You need to work hard, marketing and managing the bar, plain and simple. We’re sticking to the music, hosting something seven nights. “We have bluegrass, jazz, and Niall O’Leary is our Irish night on Thursdays with the Riverdancers and Lord of the Dancers joining him. If Paddy Reilly’s is a music bar, it is also a musician’s bar. “Reilly’s to me was always a place to try things out,” says Kirwan. “We always tried out new songs there and I think they changed the way Irish music was listened to across the U.S. by allowing experiments like that to take place. Let’s hoist a pint this week and a silent prayer into the heavens that this relationship of band and bar lasts another 25 years!